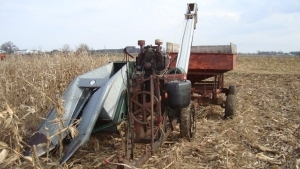 Why should we be interested in Amish technology? The Amish are one of the few communities around the world that have deliberately tried to tame technology in the twentieth century. They are more self-conscious and thoughtful about the impact of technology on human communities and restricting technology than most Americans. The Amish experience offers a fascinating case study about the intersections between technology and human well-being. What are the most pressing technological issues for the Amish? Amish businesses face significant challenges regarding the need for online connections to conduct their businesses. Access to the cyber network for business purposes soon spills over into daily life. It was easy for the Amish to say NO in the early twentieth century to cars and connections to electrical grid. However online access is not easy to control. The second issue is access to smart phones for young people which give them access to all sorts of information which historically have been screened out of Amish society. Young people who become dependent on handheld devices may not be able to discard them after they join the church. The avalanche of new technology and its easy access for Amish youth creates an unprecedented challenge for the Amish elders and Amish traditions. Why should someone attend the Amish Conference? All the leading scholars and researchers on Amish topics around the world will be here at the conference. It will be a fantastic opportunity for networking, and learning about the research and resources available on Amish communities of North America. Who should attend the conference? We will have some fifty different breakout sessions as well as interesting plenary sessions. The content and focus varies widely. People who will find the conference beneficial include scholars, writers, professional service providers (healthcare workers, therapists, extension agents) as well as anyone interested in the impact of technology on human communities. What non-technology topics will be covered? There will be numerous panels, seminars and presentations on topics as diverse as Amish quilts, healthcare screening in Amish communities, Pennsylvania Dutch dialect, the latest reports on Amish population growth and expansion, international perspectives on Amish life, TV reality shows such as Amish Mafia, the beard cutting trials in Ohio, Amish romance novels, teaching courses on Amish society etc. for a full listing see the conference schedule on the website. Registration for the conference ends next Monday, May 20th. If you’re interested in attending, you’ve missed the early-bird discount, but that’s okay, it’s not a huge difference for regular registration (about $25 more for the 3-day event). You can register for the conference online or by fax/mail. The conference is being held at the Young Center for Anabaptist and Pietist Studies at Elizabethtown College. Elizabethtown, if you’ve never been there, is a charming small town located in northwestern Lancaster County. The heart of the Amish settlement is about a 30 minute drive away, but Amish have been moving into this part of the county in recent years, with some Amish farms lying just outside of town. I read Mr. Kraybill’s book and really enjoyed it. Wish I could go to the conference. The price of the conference is reasonable, but I would have to get a motel, meals, etc. Wish they would have something in my area. I would love to attend but those motel rooms are pricey for those of us on fixed incomes. I sure wish I could go too. I know Donald Kraybill because he is related to me and because his parents and my parents were very close. My maiden name was Kraybill. His mom and dad were also wonderful Mennonite people…..so full of love. Donald came to my Dad’s funeral in Harrisonburg, Virginia. I was so pleased when he wanted all the notes of talks my dad had given at various Mennonite Churches and had carefully kept them in a notebook. If any of you can go to this I know you learn so much. Drat, I’d love to attend the conference, too; I’ve read Dr. Kraybill’s book and found it quite informative. And I sure wish I could take the Stevicks up on their guest lodging offer! Unfortunately, I have other commitments during that time period. I’ve had back luck this year with everything I’ve planned; something more important has always come along. And I’d love to have had a chance to meet you too, Erik! I do expect a complete and thorough update on the conference and as many breakout sessions as the folks here attend, though — I know I’m not the only one who will be happy to read anything about it you want to share with us! I wish I could attend! Will there be any post-conference publication of related articles by presenters at the conference, reviews of the conference, etc? This reminds me of the Luddite Congress (which as far as I know only happened a couple times?) but perhaps with more focus and more potential. Since I will not be able to attend the conference, I echo Naomi’s desire. Will you make the papers available? Naomi and Marty I don’t think the conference is planning to publish the papers if that is what you are asking. I aim to post some about it but I know that will hardly do it justice, but for what it’s worth. I will let you know here if I learn of any other records of the event being made available. I grew up in Elizabethtowm….Groff Ave to be exact. I sure wish I could visit again. I care for my mother who is 91 and has dementia. So I am home most of the time. has the session abstracts and several paragraphs of descriptions, but only for Thursday, June 6. Is there another page for Friday and Saturday? I registered some time ago, and I’m definitely looking forward to the event. The only problem is going to be deciding between competing workshops! I’ll hope to see you, Erik. I will be there Marta, and look forward to finally meeting you in person.